On the 'Dripping Pen Card' mailed on November 8th 1969 the Zodiac left us his running victim count, but this time he provided us several pointers by displaying the months. He wrote "Des, July, Aug, Sept, Oct = 7." We know of Lake Herman Road (2) in December, Blue Rock Springs Park (1) in July, Lake Berryessa (1) in September and Presidio Heights (1) in October. That is five murders out of the seven he was claiming. That meant he was indicating either two murders in August, or just one in August and another in either of the other months. One consideration was the murder of Cheri Jo Bates on October 30th 1966, that he would belatedly claim in a future correspondence. However, his statement in the November 9th 'Bus Bomb' letter is telling: "This is the Zodiac speaking up to the end of Oct I have killed 7 people." This likely meant "This is the Zodiac speaking up to the end of Oct 31st 1969 I have killed 7 people. This doesn't necessarily rule out the Cheri Jo Bates murder, although without proof this is a Zodiac murder, or a murder under the umbrella of Zodiac, it is a curious statement. Why did the Zodiac Killer specify the end of October, when his most recent murder by all accounts was the brutal slaying of Paul Stine on October 11th 1969. This could be interpreted as a sixth murder in August, and a seventh murder between October 11th 1969 and October 31st 1969. He would expand in his correspondence "I thought you would need a good laugh before you hear the bad news, you won't get the news for a while yet." In view of his 'Bus Bomb' letter declaration that he would "change the way the collecting of slaves. I shall no longer announce to anyone. When I committ my murders, they shall look like routine robberies, killings of anger, + a few fake accidents, etc," this seventh murder may have been committed in the latter two thirds of October, detailed in the total, but not elaborated upon, and the suggestion that we wouldn't get the bad news for a while was somehow related to how or where the person was killed. There is, however, a completely different alternative, bringing into play the Melvin Belli letter on December 20th 1969. This correspondence stated Zodiac was in danger of looking for a ninth and tenth victim. The assumption therefore, was that victim number eight was probably killed sometime between the 'Dripping Pen' card on November 8th 1969 (or possibly November 9th), claiming seven victims and the Melvin Belli letter mailed on December 20th 1969. But again, taking the latter 'Bus Bomb' communication, Zodiac had claimed seven victims to end of October, not up to November 9th 1969. He did state seven victims on the 'Dripping Pen' card, but he added the extra hint that "you won't get the bad news for a while yet." This may suggest that indeed, he had already killed again, prior to November 8th, but he simply wasn't announcing it to anybody, as the following communication would testify. We know that by the end of October (31st) the total was seven, therefore this unannounced eighth murder would had to have been committed from November 1st 1969 up to November 9th 1969. A contested piece of correspondence was the 'Fairfield' letter on December 16th 1969, claiming "I will go for government life." 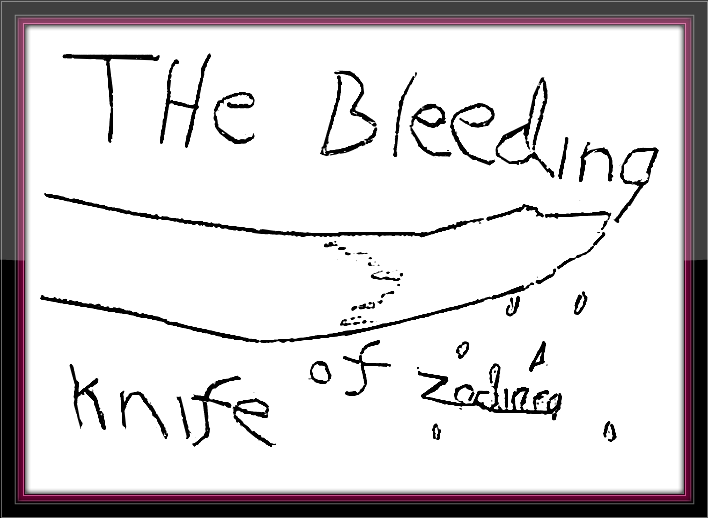 The accompanying drawing depicted the 'Bleeding Knife of Zodiac,' with eight drops of blood dripping from the weapon, suggestive of an eighth victim. Was this indicative of another Zodiac murder by knife, having been bolstered by his 'successful' attack in theatrical style, on Bryan Hartnell and Cecelia Shepard on September 27th 1969 at Lake Berryessa. Or, was the knife just a reminder to his last crime we know he committed. If this correspondence was genuine, the phrase 'government life' may indicate any person in any state run organization, with a distinct hatred towards officialdom unsurprising, bearing in mind his previous communications. The question being, can anybody find the eighth murder spanning November 1st 1969 to November 9th 1969, in a relevant geographical location, that doesn't have the hallmarks of Zodiac. After all, he did state he would "change the way of collecting the slaves". If this were the case, we simply wouldn't recognize it anyway. # A Salesian High School teacher, Daniel Williams had his house broken into, but nothing was taken. A man claiming to be the Zodiac Killer made several threatening phone calls beginning on October 23rd 1969, culminating with the caller saying "You're the dead duck" on November 2nd 1969. Later that day, Williams took a drink from the refrigerator, but fortunately spat it out after noticing a metallic taste. The drink contained enough arsenic to kill. Would a teacher be considered 'government life'. The date fits the criteria and the death could have appeared like natural causes, or a killing of anger. Hi there. This is one of the tricky ones for sure! Howard Davis must have given "Aug" some serious thought regarding a Manson connection, though I would be shocked if you hadn't already considered and discounted such a link. Bruce's beard is a deal-breaker for me but it is possible that hijacking credit for those LA crimes was on Zodiac's mind. Of course I have nothing to base that on other than the idea that Zodiac was likely jealous of the headlines he was losing. It has always pleased me that within a week of his grand debut his villain profile was soundly dwarfed by news from LA. The honesty of the author is obviously a big consideration here. His earlier claims that he wears a disguise, false fingertips, that he was seen in his brown car, and his later tally of 37 victims remain suspect. This mysterious allusion to an August murder too seems like misdirection. If he had stated 6 in this letter I would see it as a better clue towards Riverside, but because he went with 7 he must have anticipated confusion. I have no problem believing that confusion was his intent. If the Hood/Garcia (9&10) crime was definite I would surely add Bates and believe in a seventh and eighth victim. It would prove that he continued to kill after Stine and didn't care whether he received credit. Given that we are looking for a crime that doesn't necessarily contain characteristics shared with the others, what do you think can we look for? I fear that if the crime does not at least involve a car and the quick execution of an allegedly random victim such a crime could never be connected. That said, I bet the good folks on Morf's site have compiled some ideas. Are there any unsolved contenders on your list Richard? If the Zodiac was claiming crimes he never committed he certainly got lucky it would seem. Cheri Jo Bates, Kathleen Johns, Donna Lass and Richard Radetich to name a few. Only one being pinned on another would have discredited him immediately. If he did commit 7 murders early on, it seems likely this may have been questioned more in later years, when his total started seeming over inflated as you alluded to. Especially the Exorcist letter of 37, with no intervening correspondence since March 1971. You are correct, he may have claimed two of the Manson murders, but it backfired. The Furlong/Snoozy murders in August were ultimately attributed to Karl F Warner, who was also convicted of the Kathy Bilek murder on April 11th 1971. The problem with the internet, although fantastic, it doesn't cover every single murder, so it's easy to overlook a less publicized crime. I belatedly posted an attempted poisoning at the bottom of the article by somebody claiming to be Zodiac. This fell in the correct date range of November 2nd 1969, but because the article was dated November 8th, the same day as the 'Dripping Pen' card, he may have thought that his poisoning victim hadn't been discovered yet and we hadn't yet got the bad news. When the victim was found to have survived, possibly he kept quiet. The change in tactic is what he promised in the Bus Bomb letter and the caller claimed to be Zodiac. Of course there were many copycats and chancers back then, so it could be incidental. The problem we have with the poisoning attempt, is that it may have intended to be victim 8, but having failed, number 8 may have come later, anywhere up to the Fairfield or Belli letter. I too don't think the Riverside murder is projected in this total, but I will keep looking for other possibilities. Have you any other suggestions Drew? If you find any, pop them in below. Cheers, Rich. Not quite relevant to the above article, but this woman went missing in San Francisco. I posted this on Zodiac Killer Site forum. It is likely nothing to do with Zodiac mind. Ann Duncan was last seen on Friday Oct 3, 1969, eight days before the Stine murder . She had an appointment with Social Services in San Francisco, concerning foster care placement of her child. But she never arrived , the courts decreed the baby was therefore available for adoption. After always visiting her children regularly, without fail, the visits suddenly ceased at this time . Her family are of the strong opinion she would not have abandoned her children , and despite not taking care of them herself, she always kept her visits. Regular phone calls to her mother likewise ceased completely and the family believe the worst. The disappearance occurred in San Francisco on a Friday and just over a week later Paul Stine was killed and that is where it ends. The ''postscript'' debate for The Dripping Pen Card,seems to focus on the validity of 7 victims,claimed by Zodiac. What,I might venture,is more of interest,is the possibility that,Zodiac actually wrote ''Deg'',as opposed to ''Des'' [?]. Zodiac,no doubt ,claiming ''the number of the beast'' - Beelzebub - The Devil,himself ! Never heard this suggested before. It is odd mind he cannot abbreviate December to Dec. If deliberate, it's not very convincing. Bearing in mind the accompanying Bus Bomb letter with five X's around the circumference, it is an interesting observation. But degrees would now invalidate the Lake Herman Road murders in his list, which now would begin in July. I know the Bus Bomb X's can be lined up with all his crimes when overlayed on a map, but since one of the lines effectively runs over both LHR and BRS, there would be no need to include Dec in his list. This is my only contribution to this possibility. The Devil part obviously has a connection to Mount Diablo, "The conventional view is that the peak derives its name from the 1805 escape of several Chupcan Native Americans from the Spanish in a nearby willow thicket. The natives seemed to disappear, and the Spanish soldiers thus gave the area the name "Monte del Diablo", meaning "thicket of the devil." Wiki. Cannot think of any way to push this further at present, but it's definitely something I had never considered. Indeed Richard,.....I certainly take your points,on board. I believe that there is a necessity to look for continuity,and connecting ''clews'',with Zodiac's letters.....but sometimes I think that Zodiac just decided to add something,on the spur of the moment [?]. On the back of The Dripping Pen Card,he has obviously taken a pen to the word ''Jesters'',and changed it to ''Jeer'' or ''Jeers''. So,setting the quantity of victims  claimed,aside....that ''scorecard'' ensemble,has always looked like ''Deg'',to me.....and not ''Des'' or indeed ''Dec''. Hence,the ''overall'' meaning conveyed,has possibly changed [?]. Though,of course,the claimed 7 victims,remains. I have just blown up that image and it does appear doctored to read 'jeers'. Do we know this was done by Zodiac? I mean 'jeers' is a form of mocking, which would be nothing unusual for Zodiac. One can only presume that ''jeers'' is the work of Zodiac. He seems to have had a compulsion to ''doodling'',as well as the written word [? ].I am sure it wouldn't have been the cops,that changed it. I had previously put the idea of ''Deg'' to Ricardo Gomez,who then highlighted other examples of Zodiac's ''very specific 'g' '',as has been noted by the FBI,also. So,it is possible that Zodiac intended : ''Deg : July,Aug,Sept,Oct ''. Which might denote : '' .666 pi radians '' [?]. Yes,there is nothing staked on the conjecture that Zodiac may have been up to a bit of trickery,with the possibility of '' The Devil = 7'',but the ''equation'' takes on a ''broader'' claim,with respect to 7 victims,in this scenario [?]. But,if one is persuaded that Zodiac merely wanted to convey ''666'',on the left hand side of the equation,then,the 7 victims claimed,on the right hand side of the equation,could have materialised,at any time [? ].Simply his total claimed quantity of kills,to date [?]. P.S. I have tried to contact you,at your ''googlemail'' address given,but an automated message informs me that it is currently under ''maintenance repairs''.Not presuming that you desire to reply to anyone [! ]....but,are you able to confirm that this is an accurate assessment,at present ? Hi Rubislaw, my email should be working because I am getting these website messages. In regards to 666 pi radians or The Devil = 7, I really couldn't say if Zodiac was trying to convey 666. It is certainly a good argument to believe a connection, as he picked Mount Diablo for a reason. Combine Phillips 66 with the southern sign of 6 on the crosshairs and 666 may evolve. I made an argument for 666 a long time ago, but I never truly convinced myself. It's all about interpretation, and unfortunately nobody holds the monopoly on ideas. There doesn't have to be "kills" in August-possibly one. The other could be in any of the other months stated. I don't know if you believe Cheri Jo Bates as a Zodiac victim, but he could be referencing Oct as Stine and Bates. The Confession letter also stated "she is not the first and will not be the last." Could his first be the August of 66, and as you said "could have materialised,at any time [? ].Simply his total claimed quantity of kills,to date" [?]. Because I don't believe Riverside as a Zodiac crime at this juncture, I find this unlikely. But getting back to your main point, I can certainly get the Deg logic, because of the radians angle, but what the Zodiac is inferring by summoning the devil, so to speak, I couldn't say. You, like I, believe the crosshairs and map are somewhat significant. I am of the opinion the Zodiac was referring to 4 radians + magnetic north, which translates to 246 degrees, the exact angle of the black circle on the 'Little List' letter. But did the Zodiac want to convey 666 or the devil, he could of, but I couldn't prove it one way or the other. ''Deg : July,Aug,Sept,Oct '' could mean something, but not necessarily anything to do with the devil. If we take those X's I mentioned earlier and overlay them over Mt Diablo, one line passes over LHR and BRS. One line passes over PH. The third line passes over LB. One of the remaining lines heads over Lake Tahoe (a future crime possibly) and the final line heads to Montana (of Deer Lodge fame). Not just Montana, but bisects two counties in Montana, Phillips County and Petroleum County, which brings us back to the Phillips 66 Petroleum map, the Zodiac has placed his crosshairs on. Furthermore, the county code numbers of Petroleum County and Phillips County are 55 and 11 respectively and these totaled up equal 66, to provide yet another interesting feature. Kevin Robert Brooks pointed out to me that his suspect lived in Roundup, Montana, and when I placed the Zodiac crosshairs over Roundup, and set the line to 17 degrees (magnetic north in 1970) the line passed exactly over the county seats of both Winnett and Malta. I wish I had the magic 8 ball Rubislaw, but if I can find anything new I'll drop it here. Keep searching, thanks Richard. Thanks for your full reply,Richard ! As ever,generous to the hilt and,in keeping with ''zodiac cipher'' 's desire to cover any aspect of,and further the Zodiac debate. Yes,I am wholly in agreement with you on the Cherie Jo Bates murder.In essence,the writing is Zodiac's....but the slaying is the work of someone else.....who inspired Zodiac to step in on the ''warped narrative'' [?]. I believe that ''Zodiac'' had killed before.....as a ''nobody''....but the CLB murder re-awoke thoughts within him,which he was to later take to devastating levels. I am inclined to believe that he was responsible for the Domingos/Edwards murders....which I believe was unwitting antagonism of ''Zodiac'',when down on his luck,using the makeshift beach house as his temporary home. ''Perceived'' trespassing [?]. Whether ''Zodiac'' had killed,in addition to the unfortunate couple,is ''up for grabs''. Yes Richard,the 246 degrees estimate,sounds good to me....it just seems to appear that Zodiac,in the end,gave more clues than he needed,regarding his claimed bomb planted [? ].There is a body of opinion that believes that,by the time of the arrival,of the ''Buttons letter'',Zodiac was surprised that the ''Mt.Diablo code'' [Z32],had not been solved....Zodiac almost oblivious to the fact that he had simply ''baffled'',with the ''clews'' that he had already given [?]. I have subsequently found that ''Radians and inches'' can apply to Japanese Candlestick charts,employed in stock market analysis.....and the applied science of a ship's stability,which involves calculating the ''angle of heel''. So,''I keep it heeled in at Candlestick Park'',is beginning to look better and better [!]. Indeed,I take on what you comment about ''Deg : July,Aug,Sept,Oct.''. If nothing else,most can perhaps agree,that this small postscript ensemble can provoke more thought and debate,than initially seems apparent [? ].We start moving into the ''territory'' of accounting for Zodiac's actual kills....which is an area of discussion,for which there seems to be no ''exit door'' [?]. I shall try to contact you,at a later date,with respect to your ''googlemail'' address.There are,or may be reasons,sometimes,that certain ''powers that be'' elect to ''wedge'' me in,and dissuade me from full freedom to express myself,in this ''wider'' debate. On a point of the ''scorecard'' postscript,it had occurred to me that the Tate LaBianca murders,took place on the 9th and 10th of the very same ''Aug'',to which Zodiac references.In addition,that the Tate LaBianca murders accounted for 7 victims. History records that these Manson inspired slayings,sent figurative shock waves across the world.At that time,a significant amount more press exposure,than what Zodiac had recently ''accomplished'' [?]. Perhaps,Zodiac ''held back'' from an intended series of planned killings,in the month of August,believing that any crimes of usual gravity,would be ''buried'' under the enormous Tate LaBianca story,anyway [?]. Given the May 1978 Channel Nine letter,we are fairly sure that Zodiac had a thing about the Manson murders,as well as The Beatles....and how those two ''phenomena'',could create headlines. Also,a possibility that the 7 victims claimed,in the postcript,might confuse crime analysts,with that same number ,accounted for,by the Manson clan [?]. I recently read a post,which ''adventurously'' suggested that Zodiac may have escaped,by an awaiting boat,following the murder of taxi driver,Paul Stine.